Guerrilla marketing is an inbound marketing strategy that aims to promote a brand by creating awareness among the audience without actually interrupting them. It’s an unconventional marketing which focuses on interacting with the potential buyers by establishing a more personal relationship with the assistance of a group of promoters which get the word out in public about a product. The element of surprise holds the key to the success of this form of campaign. It’s unconventional because of the means through which it reaches the audience. It includes placing of eye-catching advertising stuff in places where the people are least expecting it which takes them by surprise. This was first introduced by Jay Conrad Levinson in 1984 as he published a book on “Guerrilla Marketing “. Opting these marketing tactics certainly provides a competitive edge to brands over their rivals. The term “Guerrilla” was often used in the past in the context of warfare tactics and that is where this form of marketing got its name. Similar to the warfare tactics which were formulated to take the enemy by surprise, Guerrilla marketing aims to advertise in a way that surprises the audience and tempts them to participate in the campaign yielding better results. It is an extremely low-cost affair and budget friendly. More than the capital, it requires imagination, Creative ideas and perfect execution to attract consumers. It is more suited for companies with the lower budget as it provides them with a way to enhance their reach and attract audience effectively. It is a very good way to make your brand known among your target audience without having to depend on traditional media. You generate a high impact on people, which can be converted in the long term into a strong emotional bond with your brand. 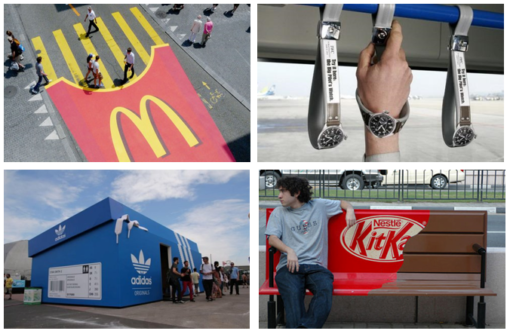 Ambient: It’s an outdoor advertising which aims to surprise the audience by placing ads in public places like railway stations, theatres, airports, benches on public parks. It’s the most entertaining and engaging campaign as users is least expecting to see anything of this sorts and are pleasantly surprised. People are more likely to be fascinated by the creative ideas of the brands and they usually end up engaging with the brand. Viral: This is where word of mouth and social media platforms comes into action. Viral Marketing encourages consumers to share their feedback on social platforms. Social media platforms serve as the perfect avenue for the messages to get viral due to their ease of access and sharing of the content. Sensation: Sudden flash mobs or fashion shows are organized to promote a brand or some specific product. Being impromptu, an element of surprise works perfectly to engage the audience. Ambush: Also known as Stealth marketing, aims to take advantage of the publicity or hype created by an ongoing national event or some sports event. Products are promoted in these events which catch the attention of a larger group of people without even realizing that they are being advertised. Given that within the main purposes of these actions is to generate voice to voice, one of the cares that companies should have when putting this approach into practice is to avoid that their message is misunderstood or give rise to different interpretations that have nothing to do with them. see what you want to convey. This requires that from a strategic point of view, define very well what is the message you want to communicate, in addition to raising very well the objective of the campaign. Transmitting an impression or message that may become misunderstood or misunderstood, just for the sake of making people talk about it and the brand, could be very costly for the company’s image and even more, if the voice a voice generated will transcend the media as in some cases has come to happen. Before launching a marketing plan, it is good to have some concepts clear. In the first place, you have to offer something that the consumer is willing to acquire. That the client likes is not synonymous with that he intends to buy it, so Marketing will not work if he does not provide the market with a product or service of real value. On the other hand, you must include the practice of Marketing in all areas of your business. This means that Marketing must not only reside in the promotion, but also in how you or your company behaves face to face with the client. The third key is to dedicate time to Marketing, in assessing its importance. In this section, the same as in the first one, it is not enough to have a good product to offer if you do not know how to reach the consumer in an attractive way. In fourth and last place, it is essential to put yourself in the position of the client and develop the Marketing plan always thinking about the needs of this, in which really your product will be useful. McDonald’s painted zebra Crossing like a packet of French Fries. Coca-cola happiness vending Machines: Coke dispensing machines were installed in a college campus wherein it dispensed not only cold drink but also pizza, chips, flowers, balloons. It took the students by surprise and created a buzz in the campus. Similarly, happy trucks in Brazil distributed free cokes and t-shirts. Marathon was organized by Adidas and Nike made a runner wear their shoes and participate in the race. Nike gained a lot more publicity as compared to Adidas which had actually organized the race. Guerrilla marketing is an interesting alternative to apply in our marketing strategies, because it allows us to communicate with our clients and potentials through unconventional channels, generating a positive memory and consolidating the brand image. But it can also help us to increase sales, customer loyalty, social recognition … everything will depend on the creativity and originality we have!!! Great explanation with examples. As we are newly started real estate firm, We are currently working with an Website design agency in Sunshine Coast to attract our customers. Here I got a great understanding on Guerrilla marketing that to implement on our business. Thanks for sharing.